Learn how to make a simple origami handbag or clutch purse with these easy to follow step by step instructions. Great accessories for dolls! 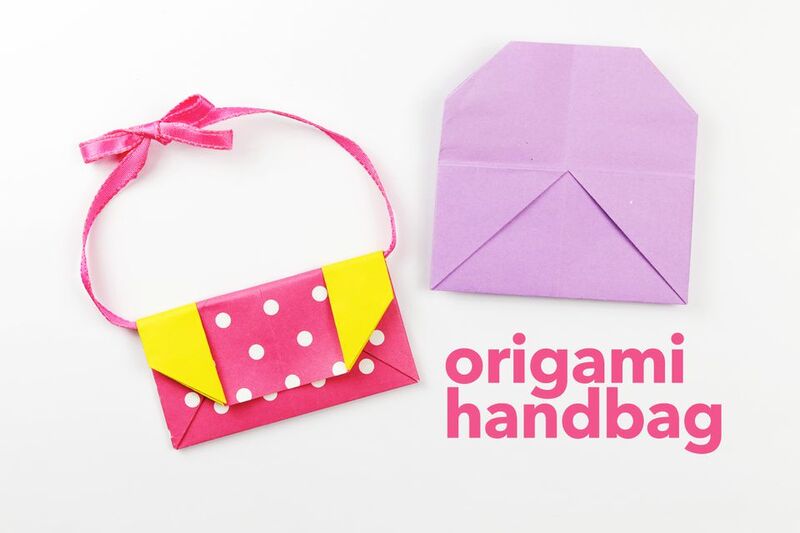 This traditional origami envelope or purse makes a great handbag too, just add a string or ribbon underneath the flap. Your daughter could use this for her barbies, this would also look great as an embellishment on a card or as part of an origami outfit. You could also make a cute origami bow! to go on the front. Or if you'd like to make an actual origami envelope, check out this easy tutorial: Learn how to make some super easy envelopes! 1. Start white side up. 2. Fold the paper in half to the left and unfold. 3. Fold the bottom edge up to the top. 4. Fold the right and left edges to the middle. 5. Fold the flaps diagonally out to the sides as shown. 7. Open out a flap and squash it. 8. Repeat on the other side and flatten it all out nicely. 9. Fold the top section of the front layer over and behind inside. 10. You should now have this. 11. Flip the model over to the other side, left to right. 12. Fold the left and right edges to the middle, you can leave a small gap. 13. Fold the front flaps back out to meet the outer edges. 14. Fold both top left and top right corners inwards, both of the layers. 15. Open out one side. 16. Reverse the V shape at the top. 17. Repeat on the other side and re fold the left and right sections. 18. Starting on the right, turn over the front layer and you'll be folding the left section underneath the little triangle that's behind it. 19. Use your fingers or a chopstick to poke the flap nicely underneath. 20. Repeat on the left side. 21. Flip to the other side. 22. Fold the top down to the bottom. You could leave a small gap if you want a more rounded purse/bag. If you want to add a ribbon just glue it along the fold. If your flap is popping back up too much, stick it down or put it inside or underneath a heavy book overnight, it will flatten out.